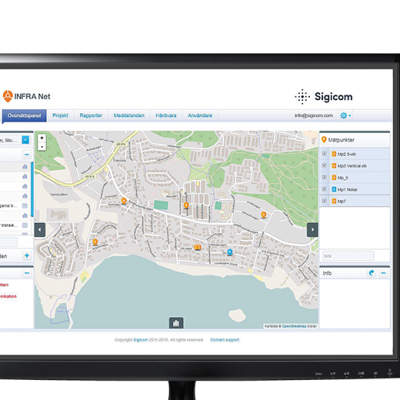 The INFRA system is specifically developed for remote construction site monitoring. With INFRA you can monitor and measure vibration, air blast, noise, dust, crack movement, underwater shockwaves, weather, moisture, temperature and much more. Have a look at our product catalogue and let us know if you need more information or guidance. 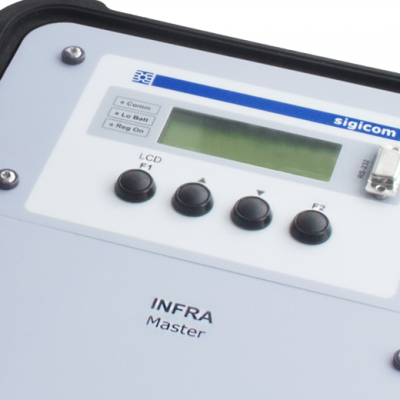 INFRA Master is a complete battery operated data logger with a built-in GSM/GPRS modem and built-in GSM antenna. The logger has two outgoing connections for the INFRA bus cable and A series of available sensors can be connected to a single INFRA Master. There is also a connection for an external GSM antenna. 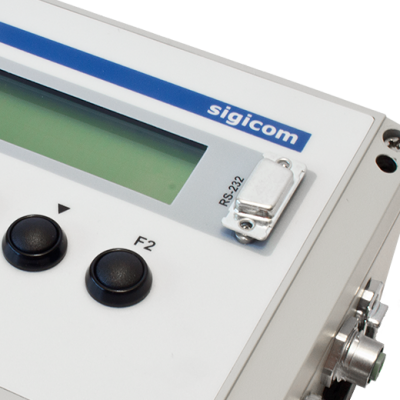 The front panel consists of four buttons (easy operation) and a LCD screen with 4 lines, each can display up to 20 characters. INFRA Master is either operated with an internal lead-acid battery or connected to mains. The data is stored on the exchangeable CompactFlash card. The INFRA Master contains no measurement electronics and needs no calibration. The INFRA Mini is a data logger with GSM and large internal memory. It features an integrated triple band (900/1800/1900 MHz) GSM with GPRS. 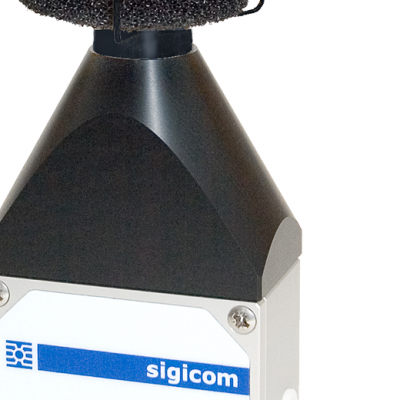 Sigicom INFRA Mini is an economical multichannel field monitoring system for vibration, noise, air overpressure, acceleration, inclination, level, pore pressure and much more. INFRA Mini is powered wid Alkaline batteries. A series of available sensors can be connected to a single INFRA Mini. 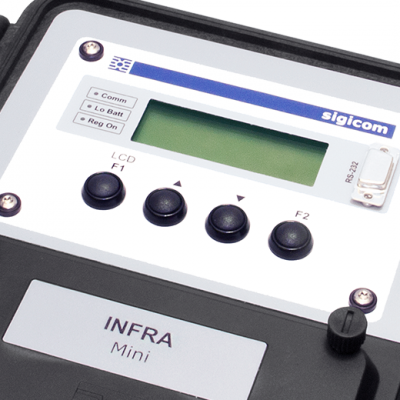 INFRA Micro is a complete digital data logger with possibility of enclosure, high capacity data storage and flexible communication capabilities. Data is automatically sent via the internal or external modem to a database on the Internet. Data is sent on scheduled times and when a trigger has occurred. SMS with event data can be sent directly from the instrument to a number of cell phones. Project administration, data presentation, reports, analysis and graphs can easily be performed with INFRA Net. 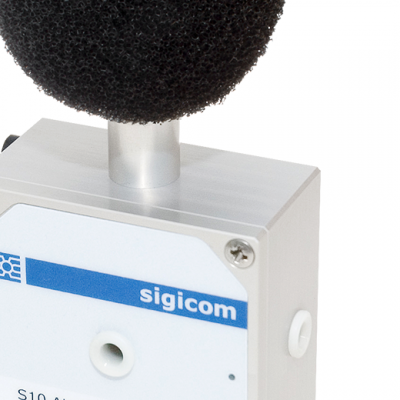 INFRA Air Blast Microphone S10/S11 measures air blast pressure to valid national and international standards. It measures both maximum values for each minute and also a complete air blast record. Designed for vertical mounting on a wall, pole or tripod. S10 is very rugged. With INFRA S50 Sound Level Meter it is easy to perform unattended monitoring of Noise from Building activities and traffic. The Sound Level Meter is connected to the INFRA buscable with a T-connector. All data from the sound level meter is recorded in the INFRA Master and can be automatically sent with GPRS to your database. You can connect more than one sound level meter to one INFRA Master. It is also possible to combine the Sound Level Meter with Geophones. With INFRA Net – software you can view real time data and information from your INFRA systems online. It is easy to manage a large number of INFRA Systems with INFRA Net. By building, administrate and report your projects directly in INFRA Net you will save time and increase your productivity. Based on the projects and measurement points you can easily extract reports in PDF format that can be sent directly to your customer. The software contains a powerful analysis function allowing you to generate different types of charts and curves from transient and interval data. INFRA Net’s remote control enables you to change measurement settings, connection schedule and much more directly from your office or anywhere you have an Internet connection. Live presentation of data, alerts/alarms transmitted from our server via e-mail or SMS directly to you. Have you read our catalogue?